CA’s summer camp sign ups will go live this week! Be watching for more information and prepare to spend your summer at CA! What an excellent show! Thank you to everyone who helped to make Steak Dinner a big success! Congratulations to Mrs. Debbie Hollis on her 25th and final Steak Dinner. We appreciate her dedication so much! Thank you to Mrs. Hollis & Mrs. Thomas for such a wonderful show! Thank you to Mrs. Dirksen & her staff for all their hard work in the kitchen. Thank you to Nick & Nicole Williamson and Coach Williamson’s art classes for painting our wonderful night sky backdrop and to Mike V. for putting it all together. Thank you to Mrs. Pitt and her fabulous student servers for all their hard work serving our meal! Last but not least thank you to our wonderful sponsors: F&M Bank, C-L Barnett Properties, Byard Construction, Clark, Herrera & Rocconi Families, Ashley Roberts’ Family, Ground Support LLC, Providence Builders, Joe Maynard Family, Wofford’s Nursery, Mr. & Mrs. Lloyd Hinote, Little Piping & Mechanical, Jenkins & Wynne, and Hawkins Home. We truly appreciate their support! Stay tuned for more details on how much we made and where the money will go! If you were unable to pre-order your video but would still like to receive a copy please email Sally Allen at sallen@clarksvilleacademy.com immediately and send payment to school Attn: Sally Allen. They are $25 each. Over the course of the next few weeks, we will host “State of the School” addresses for each of our divisions. Beginning April 16 with the Lower School and ending April 30 with Upper School, each divisional Head of School along with Mrs. Hinote will host a town hall meeting revealing our new initiatives for the 2019-2020 school year. This is something everyone will want to attend! We will offer day and evening times. Dates are listed below in the Important Dates section and an invitation will be sent via email very soon! This Thursday, April 18 is the Lower School Spelling Bee. Parents are invited to attend the Bee at 8:30 in the gym. April 30-May 3 has been named Teacher Appreciation week at CA. The CAPA will host daily meals and more for all our staff at Clarksville Academy. If you are interested in helping with Teacher Appreciation, please contact our Teacher Appreciation Chairs, Melinda Byard at cmbyard@charter.net or Regina Clift at rpclift@gmail.com. CA’s Instagram is now live! Follow us on Instagram at CACougarsTN. Have you seen our new video? We’d love you to share it on social media or with friends or neighbors you think would be interested in CA. Giving is ongoing at CA. Last week we hosted our 30th Annual Steak Dinner, which will benefit our operating fund. This annual event is much needed to offset the cost of tuition. 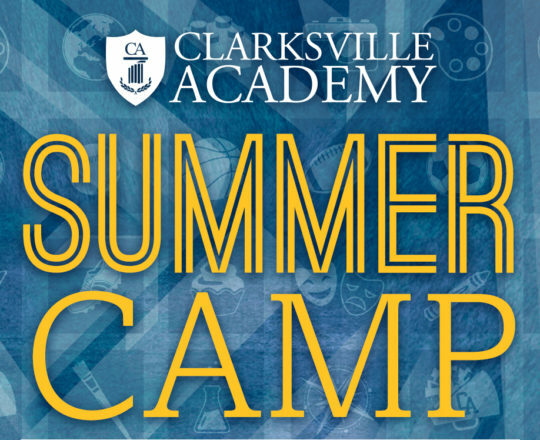 We encourage you to reach out with questions regarding giving or with ideas on how you can support Clarksville Academy in our giving efforts. Please contact Sally Allen at sallen@clarksvilleacademy.com to find out more about how you can help.